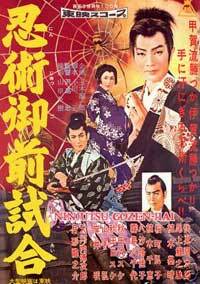 Torawakamaru, The Koga Ninja (Ninjutsu Gozen-jiai, 1957) is a short children's feature, barely over an hour in length. This film exaggerates the cinematic nature of ninja warriors, as most often viewed in cinema prior to intense & serious ninja series that began with Shinobi no mono (1962). Before the Raizo Ichikawa series, ninja were treated as "magician spies," with focus on "magicians." Thus we see ninja literally vanishing & rematerializing, leaping into the clouds, & other supernatural techniques conveyed by cheezy special FX. While it is not true there were no "serious" ninjas before Shinobi no mono, they certainly were more commonly associated with children's films. During the Warring States era, Tozawa Hakunsai (Kinnosuke Takamatsu), leader of the Koga ninja, served the Toyotomi clan. He was pitted against Momochi Sandayu (Ryunosuke Tsukigata), leader of the Iga Mountain ninjas serving rival warlord Tokugawa Ieyasu (Mochizuki Kenzai). Our young hero, Torawakasama (Sentaro Fushimi), handsome son of Tozawa Hakunsai, is introduced to the film on a hilltop performing telekensis with boulders (conveyed by running footage of rocks rolling downhill backwards). Torawakasama also exhibits telescopic vision & teleportation abilities. These & many other magic powers are conveniently not used at any point where they would intrude upon the plot to be so empowered. He meets a lost little boy named Goroichi (Ueki Motoharu) & after teasing him a bit teleports him safely home to Iga. The little boy's father is Momochi Sandayu's chief henchman Goemon (Nakajiro Tomita) who does evil things. But little Goroichi is a sweety-pie who strives to save little Princess Nene (Chie Ueki) from his father's clutches, promising he will become a flying ninja someday & carry her across the clouds. Stuff & nonsense proceeds, with side-characters providing plenty of comic relief. The "happy" ending is awfully curious since the little boy's father gets killed (boiled to death we're informed). Even though it may be the inescapable fate of villains to get their in the end, the kid & his father did love each other. Yet the kid seems only bothered by the torture-death for about half a second. For the great thing is he gets to be fostered thereafter by teenager Torawakasama, whose grinning giggly affections for the boy I sure wouldn't trust without supervision. The extreme corniness of the story makes it impossible to swallow, despite excellent widescreen b/w cinematography that makes the film visually appealing. The wildly silly "flying" swordfight shown from the waist up would be convincing only to kids far too young to follow the accompanying story. So too the climactic magician vs magician duel is pure foolery revealing such novel & previously unrevealed powers as the Koga magician turning into a toad & the Iga magician turning into a fire-breathing snake -- an element more elaborately treated in the kaiju/samurai film Battle of the Dragons (Kairyu daikessen, 1966). Torawakasama's father gets killed near the end & one of the bad guys escapes, implying a sequel if not a whole series, though I have not discovered whether or not there were further episodes, nor would I be eager to see them without some hope of significant improvement over this one.